User friendly website, very simple to place an order. I called to check on the status and they gave me an update and we received our bags on time. I will be a repeat customer and suggest custom earth promos to friends. I am in the marketing field, we recently hosted an event at one of our properties and going with reusable recycled bags as the promotional advertising giveaway was a great idea. Custom earth promos created a great bag for us and our clients and business partners loved them. I would use custom earth promos again. Great bags. A- score from me. We selected the cream "market" pattern for my fresh foods market. We were very happy with the finished product. We just standardized this bag as our typical grocery shopping bag and ended the environmentally harmful plastic bags. Our organizations logo looks great, I love how the reusable bag also has the comments about it being a recycled product. We ordered all 3 patterns of this bag with different designs of our company graphic logo printed. The most popular of the 3 patterns is the cream and green print bag. Regardless of which design our customers select to use at our farmers market, they all love the fact that the bags are made from 100% recycled materials and can be reused time and time again. Reusable bags needs to be the model for grocery shopping. I recommend any of the bags on this site. Really excited about the expose out company will get thanks to these bags! Our logo looks amazing! Our company is really environmentally conscious, so it matters to us what our products are made of. We were sold when we saw these bags were made entirely from recycled PET materials. We can feel good about distributing them to our customers. I have ordered bags from them and I like the customer service I receive. The bag is a high quality bag at an excellent price. The biggest factor of why I continue to use Custom Earth Promos is the eco-friendly aspect. They practice what they preach. Great company. Very roomy and a great way to help the environment and promote your company. I would recommend using CUSTOM EARTH PROMOS for your reusable bag needs. We have ordered the PP1 and the RB4 from custom earth promos before and they both came out great. We just ordered this bag because of the bold recycling statements that is written on the base pattern of the bags. We try to live and do business as green as we can at my company. This bag states this belief and we are happy to have our company logo on it. Looking forward to receiving the order. Love that these bags are extremely cost effective while still being high quality. Thanks CEP! This really is the perfect promotional product! We are so happy we were able to find something within our budget that is also eco-friendly. Simple yet sophisticated, these bags are ideal for our company! These bags are so strong! My clients are able to carry around all of their heavyweight items with ease. I love the matte finish on these bags. Our logo looks absolutely amazing! Customer service was great, the order came out exactly as we designed. Pretty cool that I can order bags made out of recycled bottles. It really helps us to take an eco-friendly approach to our marketing and purchasing. Very durable, I haven't had one customer tell me that the bag ripped or broke yet. I would re order this bag and recommend them to friends and family. Great company to work with. Very accommodating. We are a new business with a very limited budget. We needed to build as much exposure as possible without spending much money. Custom Earth Promos was the perfect company to work with under these circumstances. Stitching quality is good on this bag, we ordered from another supplier a couple months back and the stitching that held the reusable bag together was horrible. I advise going with custom earth promos for reusable bags. We went with the Blue bottles pattern for our grocery store. The bags look great and customers love them. I work for a large food retailer in the south west. We give our customers an option to buy recycled reusable bags and I would say more then 70% opt for it. Custom earth makes a high quality bag and one that lasts. Our customers who use them say there very sturdy, durable, easy to clean, and store away nicely. I would recommend to anyone in the food retail grocery store business to go with these bags. Quality customer care, very good way to promote green lifestyle. I suggest this bag and company. Good reusable bags. We always use custom earth promos. you can fit tons of stuff in this bag. It is a perfect size to fit lots of groceries and holds up for heavier loads such as lots of cans, gallons of milk. I would suggest going with this durable sturdy bag if your a grocery store. The black bag works best for our logo, the black background really accents our white and red logo. I would suggest going with this option of the bag to any one who has a white or yellow graphic image to print on the reusable bag. 100% Recycled Fabric That Says "I Used to Be a Plastic Bottle"
So you want a cost-effective marketing tool to put both your company and the environment top of mind? Your best option is Custom Eco-Friendly Reusable Bags made completely from recycled materials. 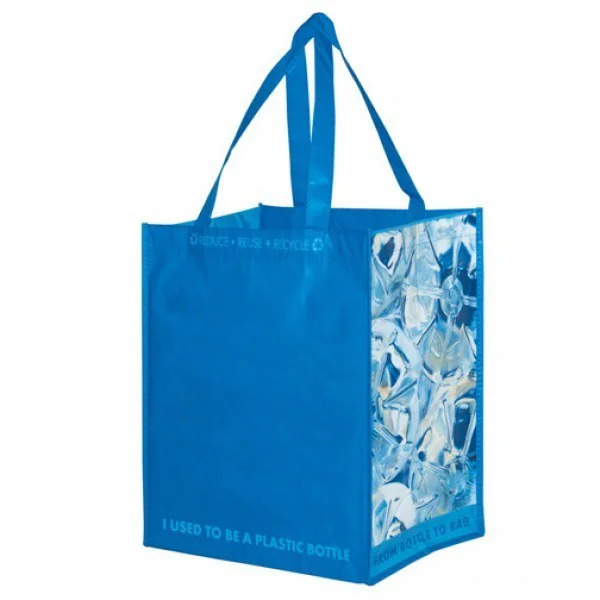 Support a great cause by adding low-cost recycled tote bags to your marketing campaign. It’s a strategy that has proven successful for countless businesses, both big and small. We’re making grocery shopping fun again! Eco-friendly promotional items—especially bags made from recycled materials—are quickly catching on with both small and larger businesses looking to expand their customer bases. As more and more people are becoming environmentally conscious, your choice to use eco-friendly promotional products will pay huge dividends for your business. Your support for eco-friendly practices will gain you instant respect among your peers and clients. Durable, stylish and practical, Custom Earth Promos' Custom Eco-Friendly Reusable Bags are the perfect promotional product to help you get behind the green cause. And what better way to promote your business (and make prospective customers happy) than by handing out attractive 100% recycled totes to your entire audience. Imagine thousands of happy convention-goers walking around like mobile billboards for your business—long after the show is over! Custom Eco-Friendly Reusable Bags from Custom Earth Promos are made from100% recycled PET material (recycled bottles). They’re available in coordinated color schemes that produce a simple yet sophisticated look. With 20-inch reinforced handles designed using the same laminated materials, this recycled bag is built for durability, strength and a comfort when your customers lift and carry it around. Our bags continue to be massively popular among consumers, and we place easy-to-read labels on the bag to verify the recycling and other eco-friendly processes we use. We build our bags with water-resistant laminated material to protect them from damage that can occur in changing climates. And our affordable prices make these bags an incredibly sound investment idea for your upcoming marketing campaign or trade show. Sturdy and lightweight, our Custom Eco-Friendly Reusable Bags prominently feature your logo, giving them amazing potential for all of your brand marketing needs. With a wide range of colors, we at Custom Earth Promos can print any logo or message so it stands out on your bags. Reasonably tear-proof, this product is a cost-effective solution that offers flexibility in its design. Made from hand-wipeable rPET material, and available in vibrant colors like blue, black, cream and green, this bag is an affordable customizable option for your next free marketing giveaway.